Once an infant in a skiff washed up on the shore of a tiny piece of land among the Elizabeth Islands off the coast of Massachusetts. Osh, the only man who lived there, found the baby, named her Crow, and began to care for her with the help of Miss Maggie, his neighbor on the nearby island of Cuttyhunk. Now it is 1925, and twelve-year-old Crow is happy with her little family, but she wishes she knew more about where she came from. The Cuttyhunk locals are convinced she came from Penikese, an island which previously housed a leper colony, and they are wary of her, refusing to make physical contact with her, to handle objects which she has touched, or to allow her to attend school for fear of contracting leprosy. When a scientist comes to Penikese to study birds, Crow notices his fire burning across the water one night, and she feels a sudden urge to also visit the island to seek clues about her origin. From here, Crow sets into motion a series of surprising events that lead to the truth about her identity, both in the past, as a newborn baby and now, as a young girl. Lauren Wolk's sophomore children's novel, published on the heels of her Newbery Honor book, Wolf Hollow, is another piece of truly excellent writing. 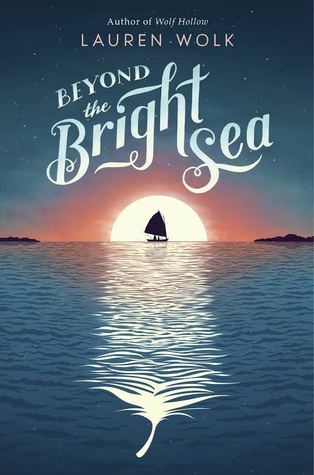 Unlike Wolf Hollow, which was initially written for adults, Beyond the Bright Sea was written with a child audience in mind, and it perfectly captures everything I think about when I imagine the quintessential middle grade novel. Everything about this book feels real and true: the insular setting, the quirky and unusual characters, the historical details about leprosy, and, most of all, the character of Crow. Akin to someone like Bo from Bo at Ballard Creek or Omakayas from The Birchbark House, she is an appealing optimist, equally loving toward her found family and curious about the one she lost, respectful of the adults who care for her, but also stubborn in her desire to know the truth at any cost. Osh, the wary and private older man who has become her adoptive father is her perfect foil: pessimistic where she is positive and uncertain where she is completely sure and secure. Osh and Miss Maggie are also the kind of adults lacking in the lives of most middle grade protagonists. The fact that they take Crow seriously and give her the latitude to explore the questions that concern her make them feel like real-life parents who truly love their child. These three characters form a wonderfully complex family unit that stirs up strong emotions in the reader. But why, you ask, would a middle grade reader want to read historical fiction about a leper colony in the first place? Well, because this is not really a book about leper colonies, or even about the 1920s. Wolk uses these historical elements to tell a story that deals with universal questions and concerns. All kids, even those who have always known their parents, are curious about the way they were as young children, and about incorporating facts about their pasts into their images of themselves in the present. All kids, too, enjoy reading about characters who feel believable and whose success matters to them. Crow doesn't come across as someone living nearly 100 years ago. Instead, she is presented as a spirited girl with an appealing personality and a strong sense of determination that today's kids can easily appreciate and love. Sure, if you try to sell this to a middle school kid by telling her it's a historical fiction novel about lepers, you're not going to get far. But if you introduce a reader to Crow, I'm convinced that reader will follow her wherever she leads because she is compelling, and everything else in the book - from lepers to orphanages - becomes interesting because the story is hers. In the old days, before politics overtook the ALA Youth Media Awards, I would have stated with complete confidence that this book would be the clear Newbery winner this winter. As things stand now, with committees yearly trying to push the envelope of what is Newbery-worthy, however, I will tentatively predict another honor and just keep my fingers crossed in case there is any chance of more. Truly, though, Beyond the Bright Sea is the best book I read in 2017. It was fast-paced, suspenseful, realistic, and emotional, with a very satisfying conclusion. I recommend it very highly and I look forward to more from the amazing Lauren Wolk. Hey!! Katie!! just like you i always wanted to be a librariion. I am also fond of books, specially self-help books and ficktion novels. How can i get my hands on your book practical guide for librarion?